Laurie Minchenberg of Passaic wanted advice and information about how her eldest son, Tuvia, 11, who has special needs, could become a bar mitzvah. But she wasn’t sure how to broach the subject with her synagogue leadership. Anne Rand of Teaneck, whose son Zev became a bar mitzvah several years ago despite learning issues, understands. The two women shared ideas at Sunday’s Yachad Parent Conference and Resource Fair at the Rosenbaum Yeshiva of North Jersey in River Edge. It brought together 200 people, including experts, parents of children with special needs, and children with special needs and their siblings. Topics included sibling issues, financial planning, and inclusion of youngsters and adults with special needs in the Jewish community. It was co-sponsored by Yachad/the National Jewish Council for Disabilities, an agency of the Orthodox Union dedicated to the full participation of individuals with disabilities in Jewish life, and UJA Federation of Northern New Jersey’s Jewish Council for Special Needs. 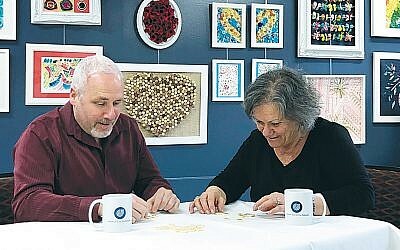 The OU has designated February, when the event took place, as North American Inclusion Month, to promote inclusion of people with disabilities in the community, according to Chani Herrmann, director of New Jersey Yachad. While she stressed it was not the point of the conference, a perceived shortage of state services in Bergen County for families of special-needs children helped provide the impetus for the event, Gallatin acknowledged. New Jersey’s Division of Develop”“mental Disabilities does not have an office in Bergen County; the closest office is in Paterson. Discussions between state legislators and JCSN regarding this issue are “ongoing,” according to Gallatin. One of the functions of the conference was to connect parents with local organizations that help fill the gap, according to Herrmann. 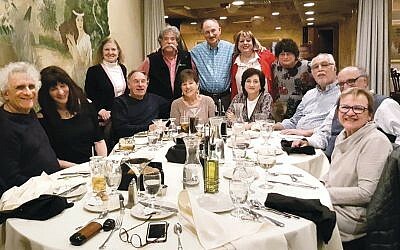 For instance, two local Jewish community centers – the Kaplen JCC on the Palisades and the YJCC in Washington Township – provide summer programming and Sunday programs for kids with special needs. Both sent representatives to the fair. Autism, Down syndrome, learning disabilities, and Attention Deficit Hyperactivity Disorder were among the challenges parents sought resources and advice regarding. Children with special needs and their siblings participated in activities including baking hamantaschen and mask-making. Gallatin ran a session on the rights of special needs children in the public schools and whether to mainstream them. “I led the parents through the exercises so they get to feel what it’s like to move through these exercises and meet new people,” said Tomasulo, author of “Healing Trauma: The Power of Group Treatment for People With Intellectual Disabilities.” He directed parents to the website Thehealingcrowd.com for more information. His discussed the myth that inclusion means participation in 100 percent of communal activities. But he stressed that special-needs children should be welcomed in youth group and synagogue life, including having bar and bat mitzvahs if possible. Yachad works with rabbis to help youngsters achieve this goal. “[Historically], some rabbis said, ‘No, he can’t be bar mitzvahed because he didn’t go to Hebrew school,'” said Lichtman. “We might help a family find a congregation whose rabbi is willing to work with a special-needs child, or better yet, provide the family’s rabbi with resources. Stephen Ehrens, CPA, an estate and financial planning adviser for Northwestern Mutual Financial Network in Fairfield, Conn., discussed setting up trust funds for children with special needs so they do not lose eligibility for benefits like Supplemental Security Income (SSI) after their parents die. He has a daughter with special needs. He added that he found the conference helpful, especially Tomasulo’s lecture. Other parents shared Ehrens’ view of the fair’s value, and mentioned the chance to bond with other parents. Minchenberg spoke of a talk Rand gave on helping her son Zev, who stutters, to deliver his bar mitzvah speech. 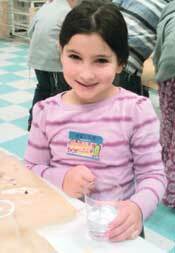 Devora Rand, 8, sister of a child with learning issues, attended Yachad’s resource fair.